The IBT-2 H-bridge module from wingxin is an inexpensive, high power motor driver based on two BTS7960 chips and is readily available from various ebay vendors; see e.g. here. The link provides more details but here are a few key parameters. I am not sure whether the heat sink is sufficient for handling 43A but even if one does not drive the unit to its limits the specifications are still impressive given the typical price point of this module (currently between $13 and $17 including free shipping from China). There is relatively little information available about how to hook up the module with an Arduino controller. This thread on the Arduino forum was useful but the solution wastes a few pins and does not demonstrate bidirectional motor control. 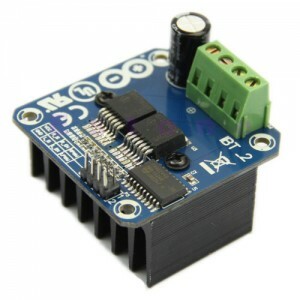 In this post I describe a slightly more complete solution that uses an Arduino controller with connected potentiometer to drive a motor via the IBT-2 module from full reverse speed to full forward speed. For reference here is the description of the input ports and the two supported usage modes (image taken from one of the ebay postings). In this post I leverage usage mode one. IBT-2 Motor Control Board driven by Arduino. Speed and direction controlled by a potentiometer attached to analog input 0. The following Fritzing diagram illustrates the wiring. B+ and B- at the top of the diagram represent the power supply for the motor. A 5k or 10k potentiometer is used to control the speed. 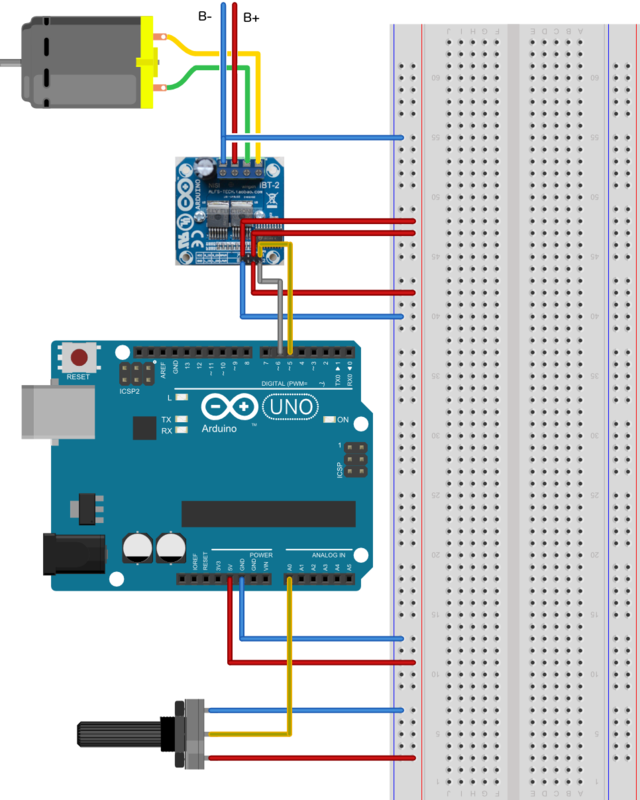 Hi, do you know if it is possible to control 3 motors with only one Arduino Uno board? Thanks! Thank you very much, Dr. Hessmer! Similarly, could two of these bridges be used to drive a high current stepper motor? is it possible to ad a feedback potentiometer to the dc motor. and code in arduino so it will act like 180 degree servo. I plan to use a similar (higher power) single H bridge to control a DC brushed motor. The bridge has a similar connection schema, including an ENABLE and LPWM and RPWM. I am worried about cross-conduction (shoot-through) protection when changing direction. My guess is that the bridge does not provide it. In that case, would such protection not be provided by always taking the xPWM pin that was fed until now to zero and ONLY THEN feeding the other? Late reply, I know (better late then never in this case). Yes this is an issue with these H-bridge models and high power uses. The H-bridge does provide a delay (switch on/off delay / slew rate), which would prevent the cross-conduction issue if you could send both PWM signals at the same time. But because of the time arduino takes to process the line of code (analogWrite in this case) it will still cause cross-conduction. I don’t have the exact numbers anymore, but the build-in delay is about 4/6 ms (depending on resistance and temerature) and the delay time between the 2 lines of code is about 4-8 ms. This sometimes causes an overlap, resulting in crossconduction. I broke about 2/3 h-bridges before I found out about this issue. The code you provides in your comment does solve the issue and no h-bridges have broken down since. Someone also suggested using digitalWrite(pin, LOW), instead of analogWrite(pin, 0). But I don’t know if this makes much difference. Hi Thanks for the post. Very useful. May I know IBT-2 can control the Bipolar Stepper Motor, if so, how to connect the motor. It is possible to drive a steeper motor with these bridges, however it is not recommended. If you are using the IBT-2 I will assume you are planning to run a high power stepper. In most cases, dedicated stepper drivers will not only control the voltage to the stepper motors, but also limit the current. The voltage applied to the motor can be a lot higher than the nominal voltage of the winding’s. This is because at higher frequencies of phase reversal, the impedance of the winding’s increases, reducing the current flow and motor torque will drop off rapidly. To overcome this, a higher voltage is used and the current is then limited to prevent damage to the motor. So while it is possible, these motor drivers do not have the precise current control that would be needed but high power stepper motors. Dr. Hessmer, thanks for sharing! Very informative and useful…I always learn something new and useful every time I visit your blog. Thx! This is exactly what I was looking for but would like to add rpm measurement via a slotted optical sensor board based on an LM393 chip and also an LCD display showing the measured rpm. Would you be able to provide some guidance on how to wire and program this additional equipment? LA Q TAL SI ES POSIBLE VER TUSA RPM HE IR CONTROLANDOLAS ASTA INALAMBRICAMENTE X BLUETOOTH PERO RECUERDA Q ESTE MODULO SOLO ES DE POTENCIA NESESITAS TU ENCODER Q TE DARA TUS RPM AHI ENCODER YA COMERCIALES MUY FACIL DE USAR EFECTIVAMENTE SON SENSORES OPTICOS LO Q TE PUEDO RECOMERDAR ES Q TRATES DE UTILIZAR AL IGUAL UN MOTOR CON ENCODER YA INCLUIDO Y UN LCD CON SU PUERTO I2C Y LISTO. Thanks for the great info!! I thought I would share how I controlled this with one PWM pin. I “drove” both the enables with one PWM pin (Pin 44 goes to R_EN and L_EN). I then used the LPWM and RPWM pins to set the direction. I also use some digital pins to power/ground the logic of the IBT-2’s (46,47,52, 53). //Code snippet for two motors on 2 IBT-2’s using just two pwm pins. Could you share the fritzing part for the IBT-2? Ibt2 do you then got some exsampel code for that. Estoy intentando programar,ARDUINO UNO,con el puente H 43A BTS 7960 B, y no consigo que funcione el motor,estoy, con el código, IBT-2, el código me lo acepta bien pero no funciona el motor,agradecería que alguien me pasara un código. I CANNOT GET THIS PROGRAM TO VERIFY IN LINE 32. I CAN GET THIS PROGRAM TO VERIFY IN LINE 32 WHEN I CHANGE IT TO THIS. WHAT IS THE CORRECT LINE 32 STATEMENT. ON THIS. I HOPE YOU CAN UNDERSTAND ME. Can you please upload the fritzing file component for the IBT-2 driver ? Sorry to disappoint. I cheated when I created the Fritzing diagram and just overlayed the wires on an image of the IBT-2. I used these motor drivers and your recommendation to run a golf cart. After nine holes, the cart reduced in power. It seems the battery running out of juice. Yet when I measured the voltage of the battery, it is at 13v. And the heat sink is not even warm. Yet, when I get home, it was running fine again. Can you offer some insight to solve this problem? This chip won’t switch higher than 40Hz. Just tried using it as the DC->AC component in a step up transformer and it can’t handle signals over 40Hz and still deliver the power it claims to deliver. Are you sure about the B+ and B-? Or does this depends on the version of the IBT-2? Sorry for the late response. You are right, the motor and battery connections in my diagram were wrong. I hope I did not cause any harm. I just uploaded a corrected image. I used the same drivers with electrical model cars – wondering if anyone has an idea how to get it in wifi version? How much voltaje is the maximum for the VCC pin in the IBT-2 H-BRIDGE because i have been connecting 9V to that pin and the IBT2 stop working, I am not sure if I burn it or the arduino is the one damage. How can I get the Transfer Function of the driver (IBT-2 H-bridge module)? please. Ralph, after badly connected power source to M+ and M- , your motor driver working? My sincere apologies for messing up the motor and power connections. I uploaded a corrected image. Ralph, thank you for the link to your diagram. I was reading your pages while on a boat. This stuff is great. This website is like the cookies to my tasty soy milk. I just shared your article on Google Plus. When I started my browser this page was running. I too connected 12V to M+ , M-. My driver not work. If I burn it driver? did you ever get this figured out, if so would you please share your code, I’m trying to do the same thing. Amazing and informative stuff. Is it work with 3D printer? I am working on an arduino 3D printer project. Can you please kindly help me for my project? Especially I would like to drive peltier with this motor driver. I only need to control voltage of peltier from 0 to 12 volts. What should be the pins (input pins) wiring. I dont need any reverse current. I would like to only give some pwm signals from raspberry pi with python and control output voltage. Thanks for your kind help. did you ever get an answer on this, if so would you be willing to share you code? I have a 12V DC motor which absorbs a current of 30A in S1 service (max 38A in S2 service). Can I safely use IBT-2 to operate the motor 30A? Someone said that IBT-2 is small for this use. I would use Arduino + potentiometer for feedback control. Im using the Motor Driver BTS7960 43A for a 24v dc motor 200watt, im using a raspberry pi to control the pwm. When I first set up I was using a frequency of 100htz, but when running the motor and motor controller got extremely hot!. So I change the frequency to 800htz. Its now running cool and smooth but could anyone tell me if this a good setting please?. Yes, the driver can get up to 25Khz. Your Motor how much current nominally (A)? Thanks ! Can you give a clue on using the IS pin for current limiting/monitoring ? 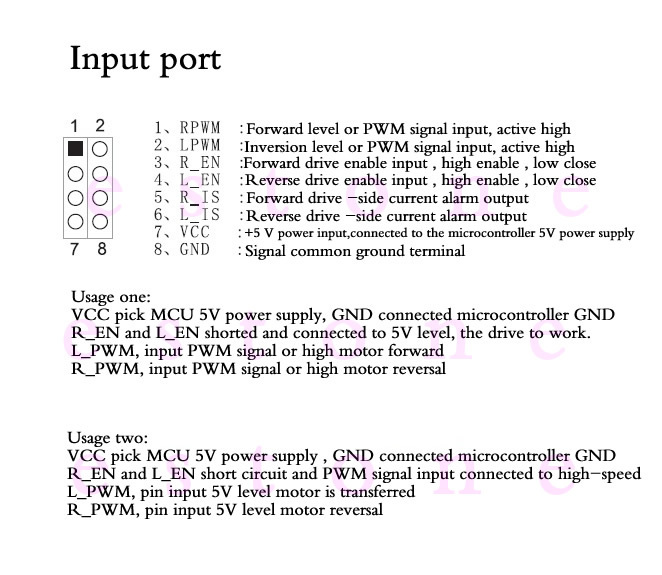 I don’t understand the datasheet for that pin. I think i connected all OK, and burn the arduino UNO with the described code. But, I can’t get to move the motor. I have any doubt aboout the GND of 12 battery and the GND of arduino. Can I connect all GND? Thanks for your effort . IBT-2 was working in minutes and your explanation made things very easy to understand…. Odd question, Is there any way I can get your fritzing part for the bts7960? How can I get the BTS6070 in the Fritzing software? I have been trying but I cant seem to find it. I have try this program code and its works fine…but how to change the input from VR (sensor A0) to read signal from the RC receiver…so i can control from the rc controller…tq. Is power supply need to be same voltage as DC motor? Is there any step down module. What I mean is I have a 18v DC motor and 24v power supply will that burn the motor? There is no step down module. You could run the 18vdc motor on 24vdc for a while, but it’s not recommended. I’ve ran a 12vdc motor on 24vdc for a while (on accident) and it did not break down. Granted, it never recieved any pwm signal higher then 120 or so, but that’s still 24v peaks going trough it. I signed up for your mailing list last week and I was wondering how often I’ll be receiving Emails from you. I really enjoyed your page. I amofficially impressed, I need to say. I have just learned new insights because of your article. Funny thing I thought I was a pro before reading your site but it turns out I am a dummy. This is helpful to everyone who reads it. Could you please tell me how to get the IBT-2 part to add it to a fritzing diagram? here to serve best and optima lsolution to solve your issues. can i get fritzing part of ibt-2 driver? I need to control a 12v DC motor using a BTS7960 motor driver on the basis of a digital input. such as the motor have to run clock wise when a digital pin is high and when that digital pin is low , the motor should run counter clock wise. what would be the code for performing this operation…? I can’t find on the web how to use side current alarm pins R_IS and L_IS. Can anyone advise the problem, & how to fix this please? Is it possible for a ibt-2 to control a motor set up as a servo as I wish to make a large high torque servo. If I run the servo motor out put in to pin one and two will it fry? hi…i connected this drive to a 12 v battery suddenly the battery burned with fire and smoke!!! !why this thing happened?i should say that the was no consumer attached to drive…no motors no actuator…dose reverse polarity connection of battery cause this?B+ of battery to B- of driver..and B- of battery to B+ of driver.is my driver burn down too? piece of writing, whіle Ӏ aam alsօ zealous of getting experience. May I ask for the ibt-2-h-bridge library for fritzing? This product is much useful for drive motor. I just want to one thing that is Can I use this drive with JOYSTICK? If yes can you send code for that. Now I am using Arduino uno microcontroller. Please help me. vorrei usare Using Motor Driver BTS7960 per sostituire una board L298N che è limitata in corrente e si blocca!! Nel mio esempio in arduino piloto il motorino dc con due interruttori NA per le due direzioni e un potenziometro per vel. Tuttavia uso solo tre pint di Arduino due digitali IN ad uno per il PWM! Ho appena comprato la nuova scheda ho cercato su internet ma non trovo risposte, come posso usare il Motor Driver BTS7960 per sostituire il L298N ? lo schetch è ottimizzato per i tre pin…. It wanted Flickr to work seamlessly with yahoo answer app (Roberto) Mail.